In the first post on the 2nd Survey, we looked into the results of some of the Western Hockey League questions. For part 2, we will look at some of the professional sports questions that were asked as part of the survey. Keep in mind, solicitations for responses were primarily done via the NHLtoSeattle Facebook page. This certainly is not a random sample of Washington State residents. If you would like respond to the survey, I intend to keep it open here for a little longer. An amazing 40% of folks that responded to the survey in Washington State went to an NHL game last year. I have been thinking about throwing out a challenge to the community to see if we can get someone from the Puget Sound to every hockey rink in the league. I had folks send me pics from Chicago, Florida and Phoenix last year, representing Seattle. Why not every rink? Nothing to surprising and tough to really compare Mariners to Seahawks and Sounders considering there is so many more games for the Mariners. I also asked about UW Football (80% of people did not go to games) and UW Basketball (92% did not go to one game). Not a local team but I asked how many Canucks games you went to last year. 20% of you went to at least one Canucks game. There has been some discussion on dilution in the Seattle market but I’ve often argued there is very little crossover with Basketball so adding both the Sonics and an NHL team would not really cause the fan base to be split, it would actually be the perfect compliment. Tough to prove that out but this next question paints that picture a little better. 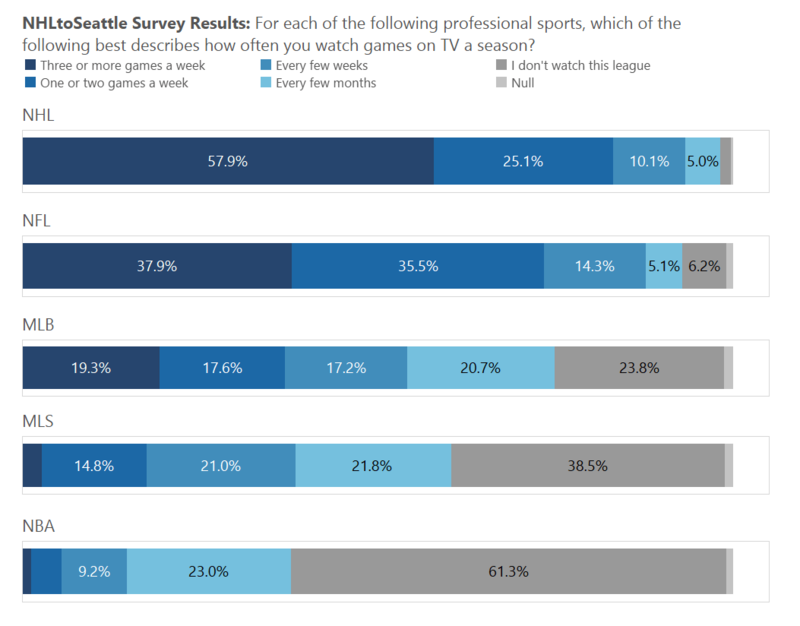 From a TV perspective, the people that responded to this survey, which are mostly NHL fans have more crossover into the NFL than any of the other pro sport. Hmmmm…so maybe the close to 1 Million people who flooded the streets of Seattle for the Super Bowl parade could be future NHL fans. It makes sense since the NHL has a lot in common with Football…minus the timeouts and setup time between plays. I hope Seattle is successful in landing an NHL expansion team. When I moved from hockey-rich Long Island, NY to Tampa in 1990 I feared my live NHL experience would cease to exist. That was true until about 6 months later we landed a franchise and eventually a Stanley Cup Champion team. Now that I am considering relocating to Seattle- can “Lightning” strike twice for me? For Seattle’s sake, I hope so!